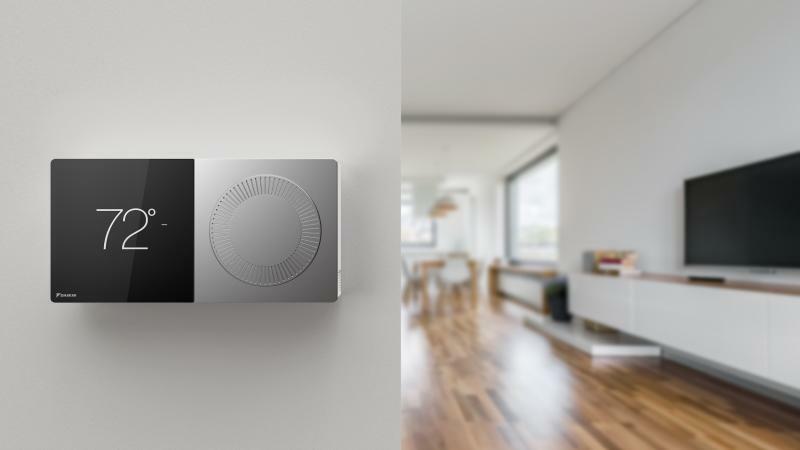 Daikin Industries says its new One+ smart thermostat is the first on the market to offer two-way communication, allowing users to interact with the system in digital or analog mode. Beyond a typical smart thermostat, the company says, it is a controller for a full professional HVAC system with a growing ecosystem of air quality modules to give consumers more control over the air they breathe. 1. In combination with the Daikin One ecosystem, it offers indoor air quality modules, including the Daikin One air cleaner, Daikin One home air monitor, and Daikin One zone monitor that all work together seamlessly. “For example, homeowners are notified when a contaminant event occurs and have the option to run the HVAC system to help reduce contaminants,” Daikin says. 2. The Daikin One+ allows users to set different temperatures in different zones of a home. 3. The thermostat interface lets a user decide how to control a home’s temperature in two different ways: digital or analog. Daikin claims it is the ony smart thermostat on the market that allows users to do this. The Daikin One+ was designed in collaboration with Fred Bould of Bould Design, a well-known industrial product designer who is responsible for the thermostat and smoke alarm for Nest Labs and the GoPro camera. New and casual users see the current temperature, turn the dial, and see the set points. Tapping on the screen reveals other key features—such as scheduled set-point changes, energy-saving away set-points, and air quality readings. Users can also opt for user-friendly mobile applications and voice control via voice assistance platforms. “Professional contractors can go even deeper into operations, but these settings are kept well out of the way of casual users,” Daikin says. A thin light strip that projects an orange or blue glow underneath the thermostat indicates the current system mode—orange for heating, blue for cooling—while a proximity sensor wakes the thermostat on approach to be ready for input. The One+ features an integrated Wi-Fi radio that connects to the homeowner app through the internet, while a sub-GHz radio gathers data from remote sensors and talks to other thermostats in the home to support independent zone control. Dual processors allow the thermostat to connect with other thermostats and the companion app, gather data from remote sensors and maintain two-way communication with the HVAC equipment to control the whole system. “Geo-fencing automatically reduces energy use and saves money when no one is home, and the device supports utility demand-response programs to further reduce energy expenses,” the company says.